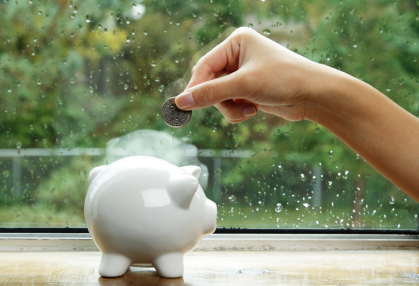 We have all heard that age old adage “save your pennies for a rainy day,” but many of us never do it. Saving money can be a bit of a difficult challenge, especially if you are in a household that lives paycheck to paycheck like so many do. However, even if you find yourself tight on money, you can still manage to put a little away each month. The good news is if you are diligent in putting money away, you will likely never have to panic when a financial emergency arises. Many people think that it is too hard to put money away. Once it is put away, they withdraw it shortly after when they experience a tight period where money is scarce. It is challenging to save, and it does take diligence. You have to refrain from giving into your temptations to withdraw the money, otherwise it will never add up. If you are hard pressed to find ways to save money, here are some ideas to help get you started. Many, if not most people have trouble doing this. Your needs are crucial, and include things like food, water, clothes, transportation, etc. Your wants are things you can do without, especially if you do not have the money to buy them. Your daily cup of Dunkin’ Donuts or Starbucks coffee? It’s not a necessity. Right there you can save $25-30 per week! Brew your coffee at home, it is cheaper. Those gorgeous pair of skinny jeans that are on sale? Nope, not a necessity either. But wait a minute, you might be thinking “Jeans are clothing.” Yes, but before you run out to buy them because they are on sale, ask yourself this “How many other pairs of jeans are in my closet?” If the answer is more than 5, you don’t need them. No, we don’t mean the aforementioned skinny jeans, focus for a minute. Cut coupons, go grocery shopping when your items are on sale, and you will save money. This is not to say you should turn into an extreme couponing person, although if you can make it happen, more power to you. Rather, you are looking to cut the cost of your grocery bill. This will help you save money, especially when you take a look at the prices of food today. Now that you know how to save, let’s take a look at how to put the savings away. It can be tempting, once you have saved a few dollars using the methods above to want to go out and spend the money elsewhere. The first place you should stop is the bank. Whether it is a piggy bank or your private branch, put the money away. Do you realize how much change is hiding at the bottom of your purse, in your jeans, and in the couch cushions? Over the course of a year, it is possible to save up a couple of hundred dollars, just by saving your change! Grab an empty water jug, the five gallon ones do nicely, or a huge piggy bank that can hold a significant amount of change. Anytime you find change, throw it in the bank. Do not touch it, except for when the bank gets full. Then, roll the change, take it to your local bank and deposit the change in your savings account. You will be surprised at how much change you really do accumulate. One of the most effective ways of saving change is to have it removed from your paycheck automatically. Since most of us get direct deposit for its convenience, you can take advantage of that. Most companies will allow you to separate your deposit into two or three separate accounts. Set a specified amount, say $25 per pay period, to be deposited into your savings account. For some people, this is a better method because they are not taking $25 physical dollars to the bank and parting ways. Saving money is essential. You never know when you are going to run into a “rainy day” where you will need that money. Medical emergencies, car emergencies, or family situations may arise where you need to dip into your emergency fund. By following the above tips, you can make these events less stressful on you and your family. What methods have you developed for putting money away? Share your ideas below! Good post! We automate as well and have been doing so for years. We also save our change in a change jar and use the money for spending cash on family vacations. It usually comes out to several hundred dollars and it’s a great visible way to teach our kids about the power of saving. I used to throw my change in a jar everyday. At the end of the month, I accumulated $40-50. I also believe very strongly in savings deduction from my paycheck. It is automatic, set and forget it. I’m a huge fan of set it and forget it. Woah $40 bucks a month in change! I agree! Also with small amounts and great frequency it develops a nice saving habit. A few bloggers have joined the sealed pot challenge, rules are you find a sealed jar, throw in all your spare change and spend it on something of your choice at the end of the year. Many are surprised how much is in there. That’s a pretty cool idea! Set it and forget it, automatic saving is a great way to do it. If one gets used to living without income, all the better. Many people tend to spend money if it’s made available to them, just like taking extra time to do things if time seems endless. Bottom line is that we all need to save, as there will be those proverbial rainy days in our future. And that’s just the way it is! I like your way of thinking… Save for the proverbial rainy days. However, when do you stop saving? How much is too much savings? Making myself so busy that I don’t have time to spend money!! hahaha.. there is always time to spend money. If you have a cellphone you have time to spend money these days. Great post! I am personally a big fan of emptying my pockets of change everyday and saving it up. Then, at the end of the year, it feels like found money when I roll it all! It definitely helps pay the extra bills around Christmas time. That is such a great idea. My hubby has a jar on his night table and he does something similar. It is amazing how much adds up over time. Certainly cutting back on Starbucks isn’t a bad idea – there is a stink over here about how much tax they are (not) paying anyway! But I am not sure it is worth tying up £/$1000s in saving for a rainy day. This is dead money that can better be used investing in higher growth funds etc. If the chance of having to find a few thousand is pretty low (and the larger the amount, the lower the chance) then a decent line of credit is a better solution. So we keep a few unused credit cards available – but do use them from time to time otherwise they will get deleted! And ensure that you have cards from different banks so you can, if necessary, balance transfer any at 0% to keep the cost down. I am not advocating credit cards for general use (unless you just pay them in full each month so they become charge cards) or for that flat screen TV you don’t really need but for the rainy day they are very useful. It depends on how you look at it I guess. I would rather have accessible savings in place,even if at a low interest rate, that could be used as an emergency fund, instead of using a credit card. I agree that most of us have a really hard time differentiating wants from needs. I think it’s important to treat yourself occasionally to keep a positive mindset, but to remember that it is a treat and not a necessity!